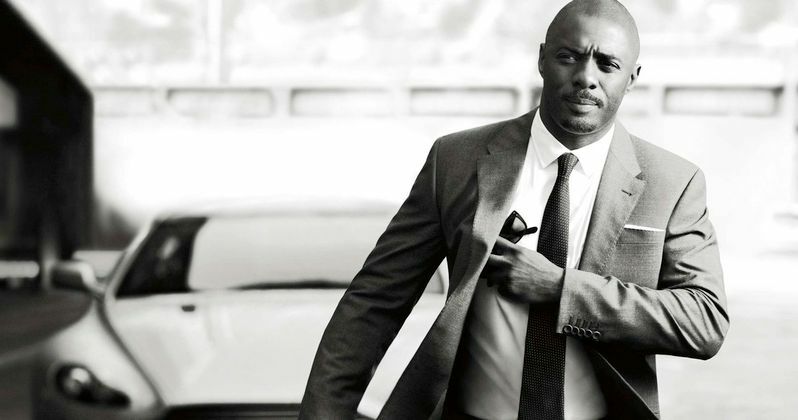 Earlier this week, James Bond fans were caught off guard by a report that stated director Antoine Fuqua had a conversation with producer Barbara Broccoli about bringing in a non-white actor to the 007 role and said that they discussed Idris Elba. However, a representative for Fuqua announced that the original report was fake news, declaring that the aforementioned conversation never even happened. Now, Elba is out on social media having some fun with the James Bond casting rumors. Early Sunday morning, Idris Elba posted a picture of his face with a caption that reads, "my name's Elba, Idris Elba," which is obviously a play on the famous James Bond quote. He let that post sit there for five hours, which sent fans into a frenzy. Speculation about Elba really taking on the 007 role was seemingly confirmed by the actor himself. However, Elba then posted a picture of iconic rap group Public Enemy and then quoted one of their best-known songs, "Don't Believe the Hype." Idris Elba is not in any official talks to take on the James Bond franchise after Daniel Craig retires from the role. But, Elba has admitted in the past that he'd be up for taking on the project if it ever came up. Back in 2014, Elba said, "It would be such an honor". The actor then talked about the perks of taking on the project. He had this to say. "I mean what do we have to do here? We have to wear beautiful suits, drive nice cars, chase bad guys and date beautiful women? I dunno, sounds good to me." Idris Elba also spoke about the James Bond rumors again in 2016, noting that he thinks that he may be too old for the franchise. Elba is only 45-years old, so the age factor shouldn't really even be a problem. Plus, Daniel Craig is 50-years old, which isn't very old either, just ask Harrison Ford. It's more than likely that the actor was being modest about all of the hype surrounding the rumors. He also reiterated that no official talks have ever happened with himself and the studio. James Bond 25 is next for the franchise, though it doesn't have an official title yet. The movie marks the fifth time that Daniel Craig has taken on the 007 role. Rumors have been swirling for years about Idris Elba coming to the James Bond franchise, but it looks like they're only rumors for now. Craig has said in the past that he'd rather slit his wrists than play the character again, but here he is, back again. This will more than likely be his last outing as 007, so a new actor will have to be chosen in the near future. Let's hope that it's Elba when it's announced. You can check out the epic social media trolling below, provided by Idris Elba's Twitter account.